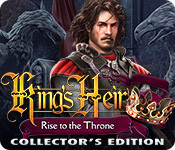 Kingmaker: Rise to the Throne Collector's Edition is rated 3.9 out of 5 by 51. Rated 5 out of 5 by rpggramma from Great game! Truly enjoyable, excellent story. Everything just about perfect: maps and info are good HOs and puzzles are very good Scenery and voiceovers are great! I especially like the fact that the words stayed on the screen long enough that I could read them( one of my pet peeves!)! This was fun!!! ENJOY! Rated 5 out of 5 by charlene_lane from IS YOUR BROTHER THE FUTURE KING? REVIEW OF COMPLETED GAME AND BONUS This is an extremely enjoyable game and I could have played many hours more. The main game is about your brother Randall Harding and the bonus is about bringing Badrik to justice. There is: * Voiceovers (with dialogue); * Casual, Advanced, Expert and Custom modes; * Interactive map; * 18 Achievements; * 14 replayable mini-games and 14 replayable HOPs; * Find 29 morphs in main game and 11 morphs in bonus. The graphics are very good and each scene is clear and precise to find the items you need. Colours are muted with lots of greys and greens (no garish blues or purples). The music is orchestral medieval and lovely to listen to throughout the game. 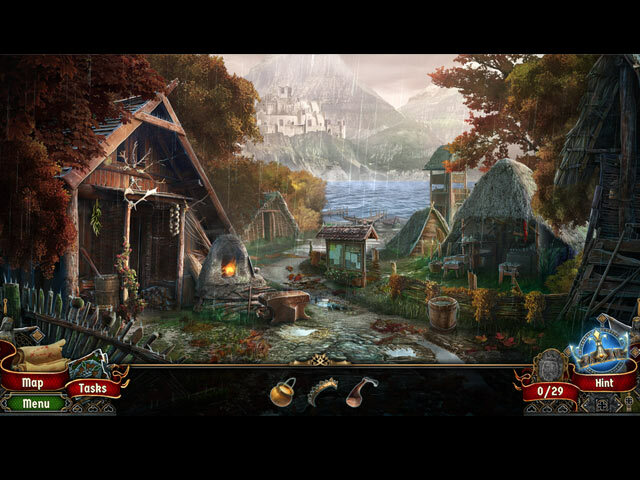 The hidden object games are straightforward, silhouette and find one item to use to find another, etc. These are easy to do because items are clear to see. Each HOP takes only a few minues to do. The mini-games are mainly very easy and it doesn't take long to get back to the game, which is good because I was enjoying the story. The morphing objects are huge and are impossible to miss. Get them all and you get an achievement. There are fighting scenes where you have to pass through all of the lines of complex grids. These start off easy but get harder as you progress through the game. The last one at the end of the main games took me ages. However, they are all very accomplishable. All up the game and bonus took me about 5 hours. In all honesty I could have played 5 more. I loved the story line, the English accents were real and I felt part of the game, rather than just clicking my way through. This game definitely comes recommend and so worth putting in your collection. Happy playing fishies. Rated 5 out of 5 by timothya from Nice Tale A very pleasant game, even for those who are getting tired of the sword-and-sorcery genre. The player's beloved brother turns out to be the rightful heir to a kingdom beset by usurpers, who frame the two for the murder of the King. Proving their innocence and regaining the throne are the objects of the game, and along the way there is a quest, a magic object, and considerable intrigue and skullduggery. Quite a bit of back-and-forth, but a very useful map takes the tedium out of it. Pros: Wonderful ambient sound effects. The rain outside the stables was good, inside them with it coming down on the roof, really excellent, so good I regretted the loss of the chance to go back and savor them. Voice acting is quite good, graphics colorful, nice balance of HO scenes and mini-puzzles. The plot is necessarily fairy-tale but has a couple of neat twists. Cons: A lot of back and forth, some silliness: are we really going to cut the reins on our transportation to pull down a branch? Not a lot of nuance in the characters - bad guys are really bad, good guys good. These are minor flaws. Overall, an excellent stand-alone game. Congratulations to the Devs. Rated 5 out of 5 by laurakay76 from LOVE this! As of this writing, I'm nowhere near finished with this game, but I already think it's one of the best games I've ever played from Big Fish. It's hitting all my sweet spots - engaging puzzles that are just the right level of challenge, beautiful visuals, lovely music, and a story that keeps my attention. I love the fact that you're not actually playing as the long-lost royal heir but as someone who loves him and wants to help him. It's so refreshing! Everything about this game is delighting me and I can't wait to see what comes next. Rated 5 out of 5 by skullfun from A MARVELOUS MEDIEVAL MYSTERY FROM ARTIFEX MUNDI & CORDELIA GAMES! A story of two (2) royal knights, Edmund and Randall Ulmer, who are tricked into a conspiracy against the crown. Pursued by the royal guard and ruthless conspirators, the brothers embark on a dangerous journey that will uncover the kingdom's shameful secrets, restore the honor of the Ulmer family and change their fate forever... Kingmaker Rise to the Throne is about two royal knights brothers who were falsely accused of killing the king. Randall was captured for various of reasons and has a hidden secret which Edmund will find out later as he is trying to sneak around in the town, and hide from the guards eyes. He will do everything in his power to save his brother and retake the throne. You'll learn the backstory about the king and what he did to his son years ago. I'm not going to spoil the story further because it is more fun to play it than read it in a review. Playing as a MALE PROTAGONIST is rare in this genre, I commend the developers for changing what gamers have been used to in the HOPA industry. The first thing I loved about this game is the art. The developers did a great job with the artwork and each location has a nice atmosphere which gives players the feeling of it being abandoned. The rain effect played out nicely too as well as the music which I was so happy to see included in the 'Extras' menu. 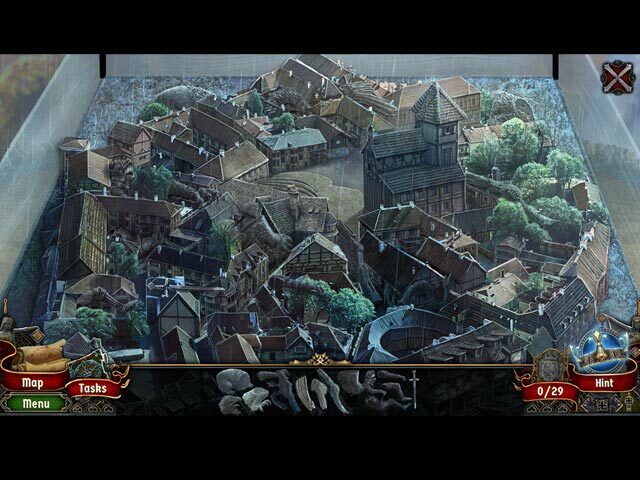 The hidden objects scenes are well made and not recycled, you won't visit the same scene twice and the fun part they included are the three types of hidden objects scenes (Shadow, words, fragment). Puzzles were nice and easy to solve, however there is this 'fight puzzle' which requires you to connect the dots without crossing the same line twice, those are repetitive but some of them are quite difficult to solve without trying a couple of times. There is an achievement for solving it from first try! Voice actors did a great job too, I liked the authentic accent of the two brothers, especially Randall, but sometimes I mixed up the two brother's voices and didn't know who was talking since both of their voices are quite similar, thankfully the dialogue subtitle colors are different. I also enjoyed the addition of the game providing us with a fast traveling map, although there isn't a lot of a backtracking, I still like the ability of jumping from an area to another. What I dislike is the lack of journals entries because I like reading the story notes. There is no way you can check the past events or the scattered papers and clues you'll find around, all what you have is an objective 'tasks' journal. Like any CE game from this genre, you can collect extra items for achievements. This collectible however 'The king's symbol' will glow next to the hint button whenever you go to the scene and the 'collectible' is there for you to pick. There is a total of 29 of them in the main chapter and 11 in the bonus chapter. There are also extra tasks like petting all animals and feeding them. Those tasks give the game a replay value which I appreciate. I highly recommend this Artifex Mundi Premium Adventure game and collaborating with Cordelia was a brilliant idea on behalf of the developers. Cheers! Rated 5 out of 5 by yowzasma from This Was A Great Game :) I,m so glad I read the reviews before buying this great game :) and I was not disappointed :) Only one tiny complaint is that there is no way to find missed collectables but the rest of the game is such high quality that I'm okay with it. I hope to see more of this Developers games soon :) I giving this one a full 5 ***** out of 5 on my personal enjoy-ability scale. Rated 5 out of 5 by BlondiPhoenixx from ARTIFEX AND CORDELIA AT THEIR FINEST! I've waited a long time for Artifex Mundi to step up their game, and Kingmaker didn't disappoint! I love everything about this game...the rich vibrant colors, the clarity of the artwork and designs of the game, the plot, the twists, the dangers, the chase, the outcome....ok, out of breath, lol. In a nutshell, this game is evertything I expect and more from Artifex Mundi. I don't know much about Cordelia, but whatever their contribution is, keep up the awesome work. Other HO game devs better step up or games of this caliber will soon put them in the corner! Rated 5 out of 5 by goatlady92 from A Glorious Game! This game ranks tops in every department. 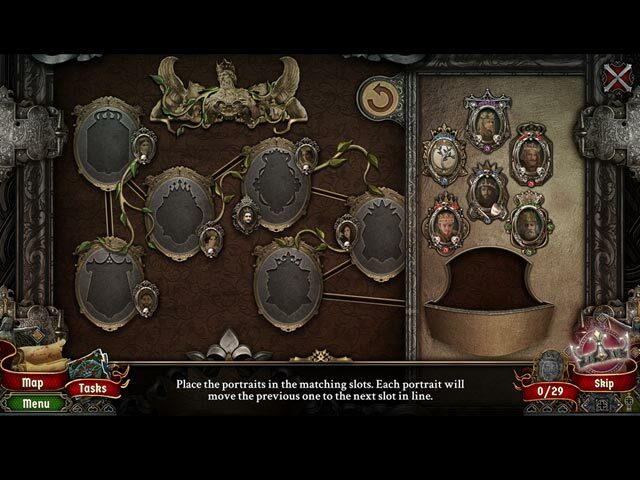 It has a great storyline, fantastic voice-overs, fun puzzles and the most gorgeous graphics I've seen in a HOPA game. Did I say the graphics were fabulous?? That's an understatement. Really, folks, this dev raised the bar on this one. Even if you don't purchase, you should try it out and see what a beautiful game really looks like. If you even give it a try, I would bet the bank that you'll wind up with it in your permanent inventory! Highly recommended! Rated 5 out of 5 by lillyrush from Amazing I just had to review this game! The graphics are absolutely breathtaking! I love games like this, the VO's are really good, I wish more BFG would have more british VO's. I played the demo for about 10 minutes and I had to get it! I had a free coupon so I decided to get it and I'm really glad I did.